Michael sings the title role in HAMLET with the Washington National Opera. Cast includes Elizabeth Futral, Samuel Ramey,and Placido Domingo! Performances on May 19, 27, 30, 2010. EM:	Michael, your performance résumé is truly impressive! Performances with the Metropolitan Opera, New York City Opera, Los Angeles Opera and your upcoming debut at Carnegie Hall. 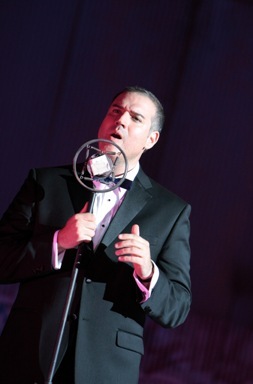 You've shared the stage with Pavarotti, Denyce Graves and Renée Fleming, to name a few. MC:	I am definitely living my dream! EM:	You've got a very impressive roster of upcoming performances including a role as John Proctor in The Crucible with Toledo Opera, your first appearance at Carnegie Hall in Beethoven's Mass in C and Schubert's Mass in G and a Meet the Artist evening at Lincoln Center. Then you make your way to the West Coast where you'll appear as The Barber in Die Schwiegesame Frau with Long Beach Opera and in A Little Night Music with Los Angeles Opera. MC:	Yes, I am preparing as we speak. Very exciting and very daunting! EM:	But that is only the beginning! Once you get back to New York in September you'll touch ground just long enough to perform in A Celebration of Poet Paul Auster at the Guggenheim Museum before you are off to Toronto to sing the role of Don in Don Giovanni with Opera Atelier. Early next year you will be performing L'arlesiana by Chilea with Montpellier Opera in Montpellier, France and then back to the States to take on the role of Scarpia in Tosca with Ft. Worth Opera and appear in John Sorel in The Consul with Arizona Opera in early spring. MC:	I know it is going to be really challenging, but I worked hard to make it happen! EM:	Absolutely. Clearly, you have come a long way since you participated in the OperaWorks program. How did you learn about it? Initially, I learned of OperaWorks through an advertisement sent to the music department at West Virginia University, where I was an undergraduate. I had some acting experience and had heard of the Alexander Technique. When I saw that these were offered at OperaWorks, I decided to pursue attending the program. While exploring the possibility of attending OperaWorks, I inquired about Ann Baltz. I learned that her reputation was superb and that she was highly regarded among her colleagues. This became the main attraction for me. EM: So, what was it like to attend the program? MC:	I had an opportunity to explore and expand myself as a performer/singer in a safe and healthy environment. While a student at OperaWorks, I learned how to free up and use my body in a way that enhances my acting/singing ability to a degree unknown to me until that time. It challenged me to be a natural-acting singer. It brought me a sense of body awareness directly linked to acting/singing that was not directly discussed or taught at school. EM:	How has the program impacted your work as a professional? MC:	The OperaWorks experience has given me the ability to act and react on my feet in any situation. I can not tell you how many times unexpected situations arise in the world of live performance. For example, a singer in the cast comes in as a replacement. There is no time to rehearse and you have to take the stage together. You know there is heightened nervousness and discomfort. Well, it's your job to make that other person feel as comfortable and relaxed as possible. You have to put aside your nervousness and think and act/react on your feet -- ready for anything. EM:	Can you give us some examples of what you have done to be accommodating in such situations? MC:	Sure. It begins by putting yourself in the shoes of your co-performers. To truly support their efforts, you must be willing and able to adjust your performance to meld with theirs. For example, ending held notes and phrases much sooner than written or singing phrases down an octave if necessary or filling blank spots in acting and singing. EM:	So how did the program help you develop these skills? MC:	It freed me as a total performer. I now have a natural and secure approach to acting and singing. To me they have become one seamless gesture. I have been critically acclaimed for my acting ability as a singer over and over again since I graduated from the program. I believe that now more than ever the opera world is a director's world. The focus has gone from the music and singing to the production and acting. This is a cyclical phenomenon in opera, and now the cycle is on the director. I honestly believe that there is not a better program that can help prepare you for these unique demands than OperaWorks. I know that the ability to perform in one seamless gesture is an invaluable skill that I have in my arsenal as a professional. It was defined by my OperaWorks experience. EM:	Clearly, you were able to glean an incredible amount from your participation in 1989. You were obviously ready for the experience. When did that preparation begin? MC:	It really happened for me in college. First, I had to embrace the fact that I would never be truly fulfilled as a Micro-Biologist! Before I became a music major, I was singing in the college choir and auditioned for a solo. I got the solo. At the concert someone heard me and came up to me after the show. He said, "You have a real talent there and you should pursue it." I didn't pay much attention to that comment. The next year I decided to take voice lessons as an elective. To be accepted into the studio, I had to audition. I sang the National Anthem because it was the only thing that I knew how to sing operatically. I still laugh thinking about it now. After I sang, the professor asked me to wait. He left and returned with another gentleman and asked me to sing the National Anthem again. After I sang, they thanked me and I left. It turns out that the second gentleman was the Head of the Opera Department. A week later I got into the voice studio. Then, the University Opera Director asked me if I wanted to perform the role of Sam in Bernstein's Trouble in Tahiti. I fell in love with it and I never looked back. EM:	You've called it a love affair. What makes the experience so special? MC:	My spirit soars in the arts. Once I performed in Trouble in Tahiti I had to keep doing it. I later went to Yale for my Master's Degree and then to the Houston Opera Program. After that I did the Merola program and the Western Opera Theater Tour. EM:	And you achieved true distinction in competition. MC:	Yes, I won many competitions and awards, including the Metropolitan National Council Competition. All in all, I have been awarded nearly six figures in competition monies. As a young singer just starting out and deep in debt, that was a huge relief for me. EM:	Now you are enjoying success in the professional ranks. What are some of the hurdles you have overcome? MC:	I would say that one of my biggest professional challenges is balancing my professional life with my personal life. It is difficult being away from the one you love for extended periods of time. Take this year for instance. In the next 12 months I will be away a total of eight. That can really take its toll on your love life. You learn how to balance things and make it work though. EM:	So how do you strike the right balance? MC:	I had to accept that this is my choice and to embrace that opera is the way I make a living. It is the way I support myself. It is not my entire life and to enhance it, I have to have a full and fulfilling life aside from opera. I love sports, other art forms, films and literature. I also enjoy a wide-circle of friends who are supportive and loving. EM:	You have been in such high demand. I imagine you have a successful strategy for preparing new roles. Please share it with us. MC:	I prepare for different roles in different ways. Right now I am preparing the role of John Proctor in The Crucible, by Robert Ward. Before listening to any music or looking at the score, I read the play by Arthur Miller on which the opera was based. I read some critical analysis of the play and characters. And, because I live so close to the location, I visited Salem, Massachusetts. Then, I started to look through the score and read the text cover to cover. Since the text was so close to the play, I already had a good grasp of it. I then began to learn the music. EM:	When, if ever, do you listen to recordings of the piece? MC:	Unlike many singers, I try not to listen to recordings right away in my learning process. I have found that I am very good at mimicking what I hear on a recording and it hinders my own vocal progress in the role. So, now I wait to listen to recordings until later in the process. I do it after I already have the role in my voice and my body. During the memorization, I work to get the role to a place where it is fleshed out. I find that it helps me to put a motion or a gesture to words and/or phrases. EM:	Do you go through the same process for music in all languages? MC:	No. When I prepare a role that is not in English, I always translate the text and then read the libretto from cover to cover. Many times it takes me several tries before I fully understand the plot. It is important to translate the whole text, not just your own. You need to know how others speak about you and what they say. This is a necessity in building your own character. There are many resources now that I encourage singers to use, such as the Nico Castel word-for-word translations and many volumes on opera libretto analysis. These things help, but should not entirely take over the learning process. The actual hard work and labor of writing a translation and looking words up help in the total understanding of the language, if you are not fluent. Even if you are fluent, many times the language is in an old form that requires extra effort to comprehend. If the opera has recitativo, I always begin by learning that. It is indeed the single most difficult aspect of opera to master for American-born singers. If and when you listen to recordings, please listen to more than one and try to get several from different eras of singing. The old live Italian recordings have been priceless in my learning process. Try to get recordings with singers who are native to the language of the opera. EM:	Let's talk about another crucial part of a singer's career. How do you deal with the business aspects of being a professional performer? MC:	There are so many competing demands, that I take them one-at-a-time. EM:	Can you share some specifics? MC:	First, let's start with the opening night party. After a show or sometimes before, you are often times invited to go and meet patrons of the opera. I know this is a taxing thing to do, but please do it. I cannot tell you how important it is for the future of opera and, of course, for furthering your own career. There has been many an occasion where I have not wanted to go and have gone and have gotten future work out of it. MC:	Yes. Word-of-mouth in the opera business is as valuable as an awesome audition or a powerhouse agent. I always remember that the bottom line is this is a business and you have to market yourself as a highly valuable commodity. I know that we all do not want to do it, but it is a must. EM:	Have you harnessed the power of the Internet yet? MC:	Oh yes. I have a web site Michaelchioldi.homestead.com and have found it to be a great resource for my career. I am listed on Operabase.com and Operastuff.com and Yahoo and Google. Plus there is a link from my manager's web site to mine via my name on their site. EM:	How are your business efforts different now that you have been working regularly? MC:	Well, in recent days, I have thought of getting a publicist. This is something to consider after your career has taken off a bit. It is expensive and you need to have something for them to market. So, you'll need to have some work behind you and some ahead as well. A publicist in NYC will cost nearly $1,500 dollars a month, so you have to be serious and focused before you undertake this step. EM:	Any other tips you can share? MC:	The best thing I do to market myself is that I always introduce myself to an opera house's publicist or marketing director. I make it known that I am willing and able to do interviews and special interest pieces. It just opens the door to more possibilities for PR. The more you can get the better off you are. EM:	Michael, you have shared so many wonderful insights. Any parting advice? MC:	Please learn from my mistakes: Try not to compare your career to any other singer's career. We all have our own individual and unique path. Be nice to everyone. Do not be a diva. Be a supportive colleague. Most importantly - MAKE GOOD ART!!!!!! EM:	Thank you for spending time with OperaWorks. MC:	My pleasure. I am so very grateful for what OperaWorks has given me - the framework to do what I love with intensity and passion. Thanks to OperaWorks for helping me to live my dream!